This attractive lodge located on a 122-acre horse stud farm in beautiful Carmarthenshire has stunning views and a large covered terrace. Minutes from Brechfa Forest it has a mixture of ancient forest, managed woodlands and is part of Cothi Valley. This provides walkers, cyclists and horse riders with beautiful circular routes to explore. Stayed here with my partner for a few relaxing nights away, and although the lodge is based on a farm you still get privacy and those views are fantastic! I know there are things to do in the area and i know Mez (the owner) is more than happy to help if you have any questions or want advice on what to get up to in the day. Our stay was more of a ‘lock up and stay in’ stay as we have busy lives, so it’s perfect for any type of get away! The hot tub was fantastic and we made good use out of it, morning and night! We adored the little peacock that roams around we thought he was a character, and the horses come right up to the lodge in the mornings as if they are saying hello (and want you to feed/pet them!) we both missed it as soon as we were home, the lodge really makes you feel like you’ve gone to another country, and sometimes we forget how stunning parts of Wales are, as we only live an hour away from this place! Would definitely recommend! What a treat this little lodge is. Spectacular views across the valley. Stunning location. Greeted each morning by the horses in the field opposite. The peacock always comes to say hello, as do the two little farm dogs. Lovely to watch the rabbits hopping about in the fields, and the red kites hunting for their prey. This evening I met the local bullocks and have loved watching them each day munching away at the grass in the field down below. 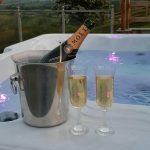 The hot tub is just wonderful and made our holiday even more relaxing. I really do not want to leave this wonderful place, it’s just so picturesque and we loved every minute. We intend to return. Thank you for a wonderful Welsh treat!! What a wonderful week we had at the Lodge last week. It is a fantastic place to stay with everything you need – including welcoming Welsh cakes! The washing machine and tumble drier were especially great for our muddy clothes. There were 5 of us (including a teenager and younger children) but it was very comfortable. The kids had a wonderful time in the countryside and we visited some great places. We really enjoyed the walks in Brechfa Forest – they have fab bike trails too. We also went to Dolaucothi Gold Mines which is nearby which was a good place to visit. The beaches are easy to reach too – we went to Tenby. The Wickedly Welsh chocolate factory is a good rainy day activity. It’s such a fantastic base to stay at or just as easily to relax in. Also what a wonderful hot tub with stunning views of the countryside. It really is a wonderful little gem. Mez, the owner is really helpful and has created a lovely Welsh gem to share with us all. We hope to return again. Little Piece of Welsh Delight!